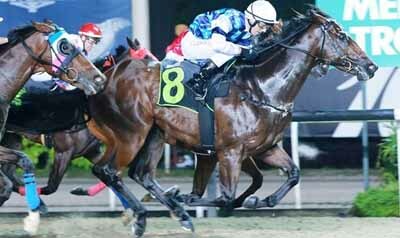 New Zealand trainer Donna Logan has not taken long to notch her first win in her new base Singapore. Her first runner WHAKAARIA MAI finished unplaced on Tuesday night and she saddled COMMAND ROYALE to fourth spot tonight before GREEN STAR captured the final event at Kranji. Ridden by fellow Kiwi Craig Grylls, GREEN STAR chased the pacemaker SUPER DANMAN from the start before taking over the lead, then staved off the challenge of FUSION POWER to win by a neck. "We’ve been here only for a short while and to get that first win out of the way is a big thrill. We actually rated both horses to win tonight," said Logan. "At the top of the straight, I saw him (GREEN STAR) up there and I was hoping he would hang on." Logan, 57, won 850 races in New Zealand, including 60 at Group and Listed level.